These requirements are provided here to inform potential developers and surveyors of the City of Cedar Hills standards and to assist them in creating an as-built file for submittal to the city. The standards and requirements contained herein shall apply to all development and/or construction within the corporate limits of Cedar Hills. Estimated completion of the structure is November 2008, at which time they will begin to establish a management team for the store and hire their associates prior to the grand opening in February 2009. With this development there are two retail buildings for a variety of smaller stores located right on 4800 West. Walmart plans to begin construction in the early spring of 2008, after the winter season passes. They estimate a 10-month period for construction and setting the inside of the store. About three months prior to opening, they will begin to establish a management team for the store and hire their associates prior to the grand opening. The following press release was issued to quell recent claims that Walmart and the City of Cedar Hills are not working together to reach a satisfactory development agreement. Download the press release. On April 3, 2007, the City Council will address the Walmart preliminary plans again. Note: The meeting will be held at Cedar Ridge Elementary School, 4501 W. Cedar Hills Drive, at 7:00 p.m. The public is welcome to attend. On April 2, 2007, the city received a noise analysis from Kleinfelder West, Inc. (Kleinfelder), who was requested to assess the level of noise that may be created by potential noise sources at the proposed Walmart facility and to evaluate whether the proposed noise-control features will be adequate to meet a 50 decibel (dBA) noise level criteriea for adjacent residential land use on the north side of the proposed Retail Center. Below is the analysis, including maps. The city is currently addressing site plans for a Walmart and two retail outlots for the commercial property, located at approximately 10000 North (Cedar Hills Drive) between 4800 and 4600 West. View the plat map. 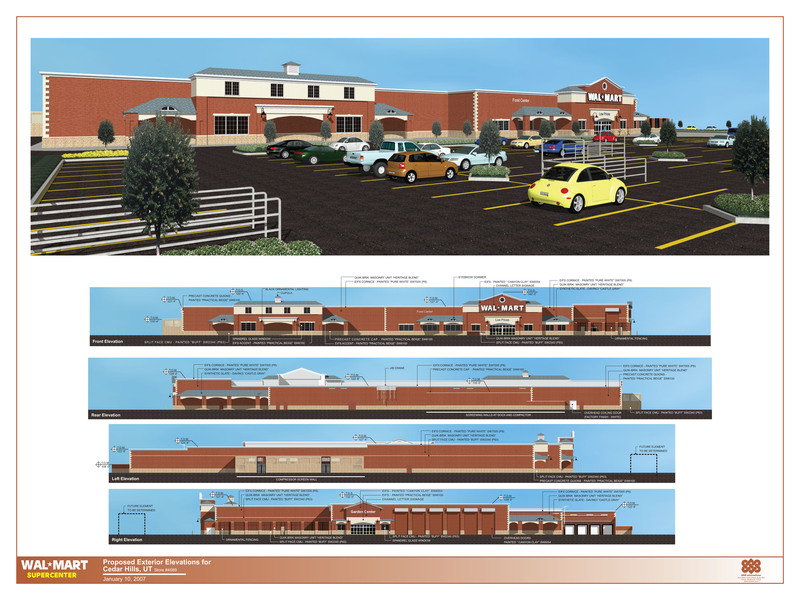 On January 25, 2007, the Planning Commission received public comment at their regularly-scheduled meeting regarding the preliminary plan for a proposed Walmart. Conceptual approval was given with a few recommended modifications before it was passed on to the City Council for final consideration. The City of Cedar Hills is pleased to announce receipt of an application for a master-planned, commercial development anchored by a Walmart grocery and merchandise store. View the press release. Lexington Heights is the first commercial development in the City of Cedar Hills. The Lexington Heights Office Park consists of four buildings, three of which are a combination of dental, medical, and professional offices. The fourth building, The Charleston Assisted Living Center, located at 10020 North 4600 West in Cedar Hills, opened in December 2005.